What are hot lather dispensers? Hot lather dispensers are wonderful machines that transform your shaving cream into something superbly warm and comfortable, just like the shaving cream that your barber uses when he gives you that awesome straight razor shave right after your haircut. The best part about hot lather (besides feeling incredible to put on your face) is that it softens your facial hair, making for a much better, closer and more comfortable shave for you or your customer. For this guide we will cover the top 3 options each category, both professional and home use. 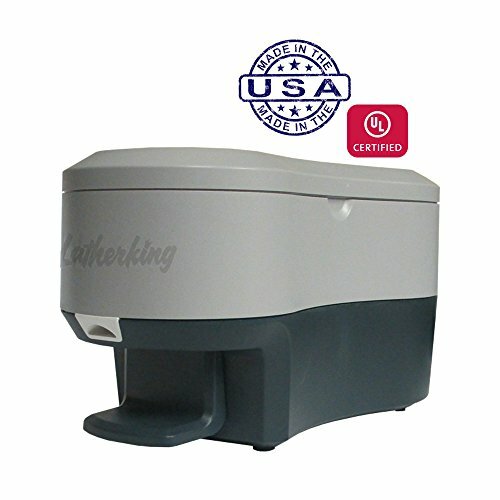 As you can imagine, there is quite a difference in prices between professional hot lather dispensers and the ones that you would use in your home, as most professional barbers will need a higher quality machine for heavier use, and most home users can save money by not needing all of the features of a professional machine. 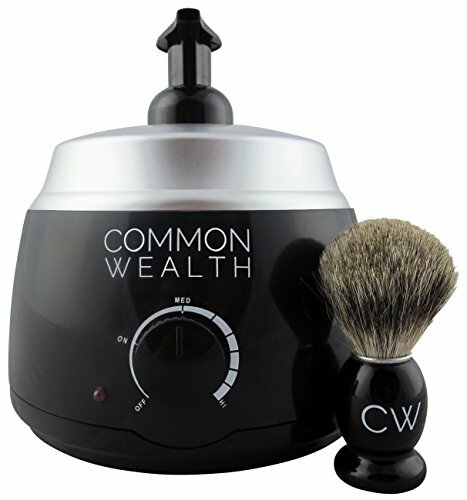 Common Wealth is a styling products company based out of California that specializes in professional grade stylist tools and products made just for men. They bring us our number 1 choice for at home hot lather machines, the Common Wealth Deluxe. This machine is pretty great for the relatively low price that it is, it really could be just as capable of sitting on your bathroom vanity at home, or on the counter of a professional barbershop, as it checks all the right boxes for versatility. In fact, one of the touted features of this machine is that is excels at dispensing hot, smooth, barber quality shaving cream. Its design makes it easy to fill the large 680ml reservoir, and easy to clean it too, which is really the only maintenance that you need to worry about with this dispenser. One of the best features is that it heats up quickly, which is great for when you need to snooze a bit more in the morning. The handy indicator light lets you know when it is ready to go. The thermostatic control dial on the front of the Deluxe lets you really dial in the right temperature for your hot lather to be the most comfortable. Common Wealth stands behind this machine with a 1 year limited warranty, but the simple design should last much longer than that. As a bonus, they have put 8oz of shaving lather concentrate and a badger hair shaving brush in the box to get you started. Works with travel & regular size cans of shaving cream . Remove Can Dispenser Cap and Place Lather Cap over Aerosol Straw. 1 1/4" Opening. 3.5" Diameter x 2" H.
Heats up in less than 1 minute! The Conair HLM5CS is our second best choice for a hot lather machine designed for at-home use. It’s inexpensive and good, earning double points for it’s affordability and usefulness according to it’s users. 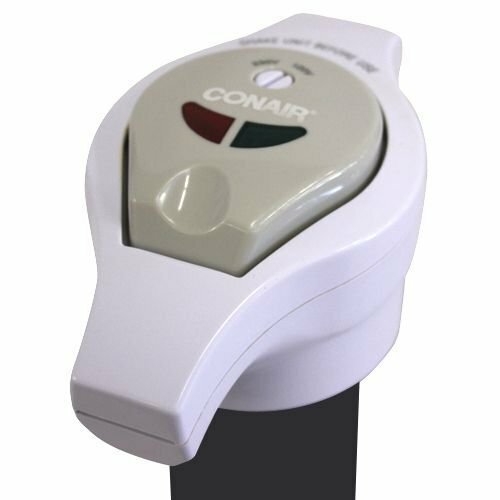 This beauty of a machine that Conair has produced features variable temperature control and worldwide dual voltage compatibility for powerinng the system. One of the best parts about this dispenser is that it works with almost all popular brands of shaving gel or cream that come in 10 or 7-oz. cans. That is a great feature, which alone keeps you from being tied to more expensive hot lather specific creams, instead allowing you to use the cream you already have or that you prefer, which is perfect for the home user. It also features a red indicator light which is very useful, as it alerts you when it has achieved the shaving cream temperature that you set with the variable temp control setting. The Conair HGL1R is our third choice for at-home use hot lather machines. It’s very inexpensive, which is almost undoubtedly it’s best feature, however it really just can’t compete on the same level as our number 1 at-home choice, the Commonweath Deluxe. It features variable temperature control for shaving cream or gel consistency, making for a close, comfortable shave. This dispenser also has a useful indicator light that will alert you when it has heated up the shaving cream and is ready to go. The HGL1R/NR uses your standard 120v home outlet power to warm up your cream, and the best part is that most popular shaving creams will fit right inside of the outer body of the dispenser. It won’t stun you with amazingly good looks or perfectly flawless operation, however for the price there’s just no other good way to have hot shaving cream ready to go. It would make a great addition to any shaver’s bathroom, as well as a good, useful and inexpensive gift. If you have a barber shop and a need for hot lather all day long at the push of a button, this is the machine for you. It turns out that it’s kind of difficult to find a machine that just works when you need it. Most of the other machines out there have not-so-great reputations when it comes to heavy use in a barber shop. 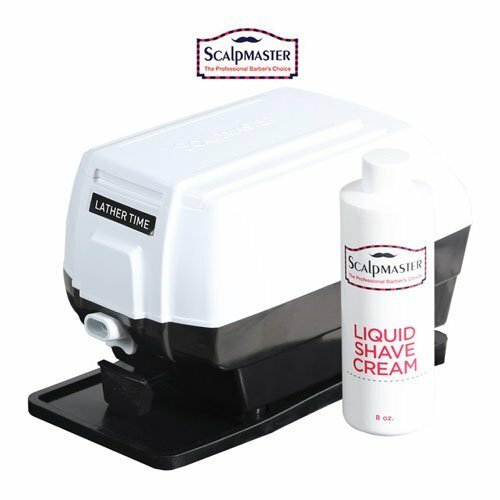 Scalpmaster makes the Lather Time machine, and they have catered the design for professional barbers to be able to rely on the machine to pump out hot lather all day long. If you’ve purchased another latherizer recently for use in your shop and have had it fail, you’ll know why reliability is bar-none the top feature for professionals. The reviews on this do tell of a couple minor issues, as no product is truly perfect 100% of the time, however the overall score for this one is much better than any of the other competitors for professional latherizers. For the price, it’s a very capable machine and an overall great deal. As the name Lather King suggests, Campbell’s hot lather machine had been the “king” of pro hot lather, and for a good reason. It’s been a barbershop icon for the past 50 years and is one of the best professional machines available at the moment. The LatherKing Next Generation features a dead simple to use one-handed push button to instantly dispense an aerated flow of hot, thick and wet lather with no fuss. One-handed dispensing is very crucial, as any barber could tell you. 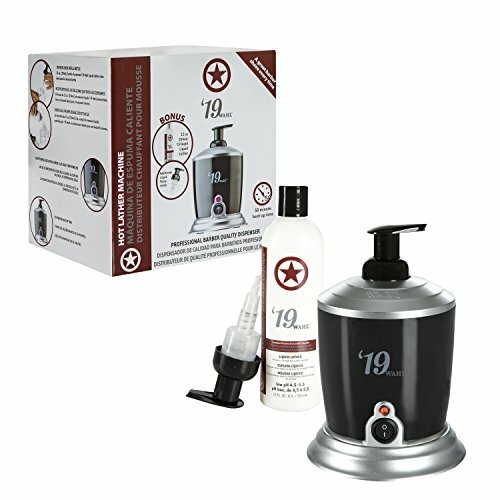 Made in the USA by Campbell, you can easily tell that their design has been refined over time, real thought has been put into making sure that this dispenser will last through the rigors of daily barbershop use. Inside the Lather King, you’ll find that they have used a stainless steel valve for longevity and reliable dispensing. They’ve also fully enclosed the electric motor and the heating element, to keep them waterproof and protected from rust and corrosion, which is definitely a smart idea. Externally, they’ve upped the usefulness for a busy barber by making the soap cup extra-large (less refills) and easy to clean. Their great design of the soap cup makes cleaning super simple, as it lifts right out of the top for easy rinsing. PROFESSIONAL PRECISION: From Wahl Professional's commercial grade line of products, the '19 Hot Lather Machine is intended for professional use only and is designed to deliver the sharp performance that experts demand. Sometimes the best designs are the simplest ones. If you want more of an old school pump type experience for making hot lather, then the Wahl is your best choice. By cutting down on moving parts that can fail, Wahl has made a great, simple design for greater reliability. It takes just a tad more effort to dispense than an automatic machine like the ones above, however that also means that the machine is likely to last longer without leakage as there are simply less parts to fail. This simple design makes it a great choice for barber shops that want a no-fuss experience for making hot lather. It just works.